On Wednesday 18th October 2017, Charles Hurst Jaguar proudly hosted the Northern Ireland Debut of the New Jaguar E-PACE, at an exclusive one-day preview event. The Jaguar E-PACE arrived ​early Wednesday morning and was revealed at lunch time when guests were invited to visit our Boucher Road Retail Unit to be the first in Northern Ireland to catch a glimpse of Jaguar's first ever compact SUV. 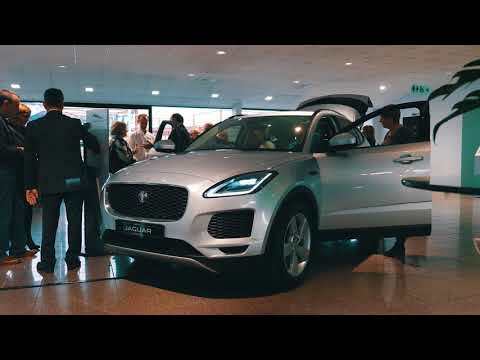 Throughout the event Jaguar Brand Ambassadors and our dedicated Sales Team were on hand to showcase the Jaguar E-PACE and demonstrate its unique combination of looks, class leading interior stowage and innovative technology. In the evening, guests enjoyed an exquisite array of canapes that were freshly prepared by Posh Nosh Ireland, while sipping on delicious Gin Cocktails courtesy of San-Greal Events. A successful day was had by all and the Jaguar E-PACE exceeded expectations of both guests and the Jaguar Belfast team. Thank you to everyone who joined us for this exciting event, we are looking forward to seeing the Jaguar E-PACE back in Belfast again very soon!